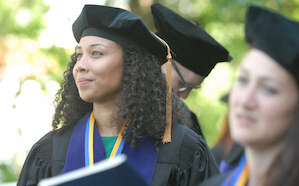 Students looking for a top-ranked law school—known for its exceptional scholarship, superior teaching, and demonstrated success in preparing students to practice law or enhance their professional careers with a graduate degree—should apply to Emory University School of Law. Our students learn how the law can be applied to almost every area of life, and that they can help individuals, families, corporations, and institutions to understand and navigate the legal landscape. At Emory Law, the classroom is a revered space of learning and collaboration. Emory Law requires that your letters be submitted through the LSAC letter of recommendation service. This service is included in your CAS registration subscription. Your letters will be copied and sent to us along with your CAS report as soon as your file is complete. Do not submit more than two letters of recommendation. Emory Law does not require a dean’s certification form. A complete CAS report consists of all undergraduate transcripts and at least one reportable LSAT score. Once we receive your application, we will initiate the request for this data from CAS. LSAT score: We only consider your highest LSAT score, which must have been taken within the past five years. Official transcripts: A transcript from each college and university attended should be sent directly to Law Services, Box 2000-M, Newtown, PA 18940-0993. Do not send this information to Emory Law. The CAS will analyze and duplicate your transcripts and will send a copy to Emory with your LSAT scores. Lawyers are professional writers. In our experience, virtually all employers look for graduates with superior legal writing skills. Emory devotes substantial resources to teaching legal writing, with all students receiving significant individualized attention. Students who come to law school with solid writing skills are in the best position to take advantage of this training. Accordingly, in making admission decisions, Emory looks carefully at writing ability as evidenced by the LSAT essay, submissions with the application, and letters of recommendation. Emory Law requires the submission of a personal statement. You should describe any skills or traits that you have had an opportunity to develop to an unusual level and discuss any significant activities or work experience that might enrich your study of law. You may choose to write about any topic(s) you believe would be most helpful to the Admission Committee as it reviews your application for admission. The personal statement should not exceed two typed, double-spaced pages. Applicants will disadvantage themselves by disregarding this limit. You must pay the $80 nonrefundable application fee ($40 if you apply before November 1.) via the LSAC online application. The nonrefundable fee is not credited to tuition in the event of admission. Emory Law offers application fee waivers for financial hardship if LSAC grants you a financial waiver to take the LSAT. If so, please submit a copy of the LSAT financial waiver tojdadmission@emory.edu. 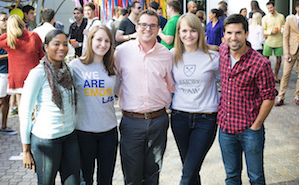 Emory Law will contact applicants directly with whom we wish to offer merit-based fee waivers. We encourage all candidates to register for the Candidate Referral Service (CRS) through LSAC. Emory Law invites previous applicants to reapply. To reapply, submit a new application through the LSAC electronic application service. On your application, indicate you are reapplying. We no longer reactivate previous applications. It will be necessary for you to submit all documents required of new applicants. Please contact us at jdadmission@emory.edu with any questions. The Class of 2022 (beginning Fall 2019) juris doctor application is now available on the LSAC website. Applicants are required to take the Law School Admission Test (LSAT), administered by Law Services of Newtown, PA, and to use the Candidate Assembly Service (CAS) provided by Law Services, which submits an unofficial college transcript, letters of recommendation, and LSAT score to Emory Law. We strongly recommend taking the June, October, or December LSAT exam the year before entering law school. We also accept the February LSAT.